Grease a Bundt or angel food pan with cooking spray. Open the French bread and place the dough log on a surfaced sprinkled with the flour. Use your palms to roll the log of dough until it is about 20 inches long. 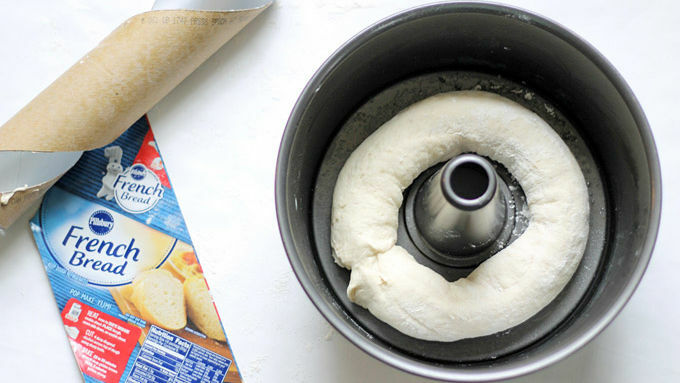 Circle the dough into a ring and pinch the edges to seal. Place in the prepared pan and bake for 20 to 22 minutes, or until the top starts to brown. Let the bread cool in the pan for 5 minutes. If using a Bundt pan, invert the ring onto a cutting board. If using an angel food pan, just transfer the ring to a cutting board. 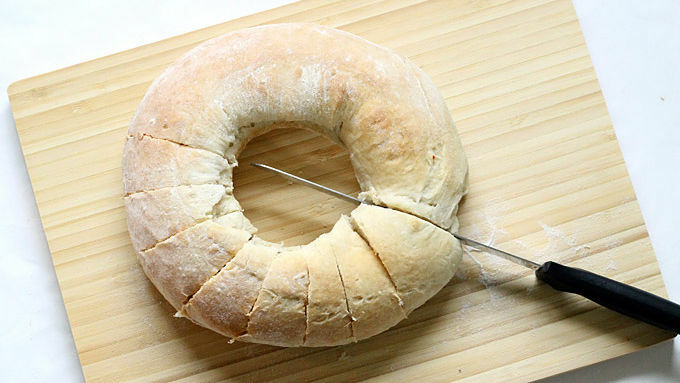 Let the bread cool to the touch and use a serrated knife to cut slices about 1-inch apart in the bread around the ring, making sure not to cut all the way through the loaf. Stuff a rounded teaspoon of pizza sauce or marinara sauce between each slice. Then, stuff mozzarella cheese between each slice, reserving a few tablespoons of the cheese. Stuff a few pieces of pepperoni and spinach leaves between each slice. Transfer to a baking sheet lined with parchment paper. Lightly sprinkle the remaining cheese over the loaf. Bake for an additional 7 to 10 minutes, or until the cheese begins to brown. Serve with extra pizza sauce or marinara sauce (warmed) on the side for dipping. In place of pepperoni or spinach, choose any other favorite pizza toppings. 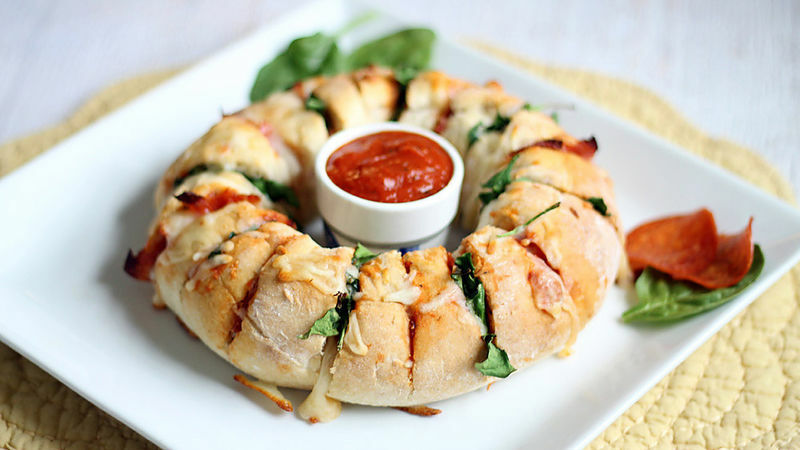 Bake up bread in a round pan, slice it and serve it stuffed with cheese and goodies. Cheesy, gorgeous and so tasty, this is a go-to appetizer plan. 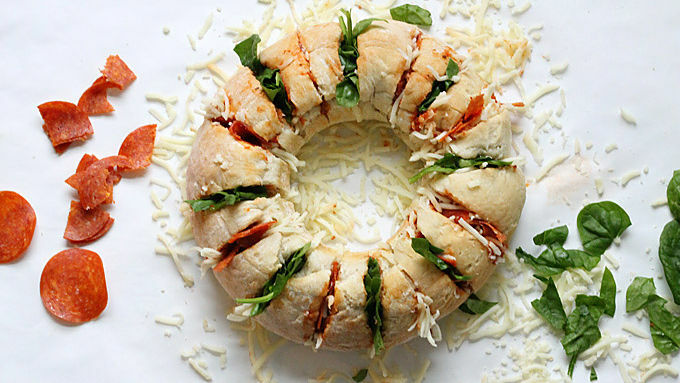 I won’t go so far as to say this Cheesy Pizza Party Ring revolutionizes pizza eating, but… you know what? I will go that far. The Cheesy Pizza Party Ring revolutionizes pizza eating. The combination of crusty bread with traditional pizza toppings presented in its darling ring shape makes serving pizza way more interesting and fun (not to mention delicious). Perfect for any party. Or you could just make it for dinner one night for something different. It’s one of those foods that looks like it takes a lot of effort, but is secretly super easy to make. In place of pepperoni or spinach, choose any other favorite pizza toppings. Transfer to a serving platter, and serve with warm pizza or marinara sauce in the middle. Accept applause.